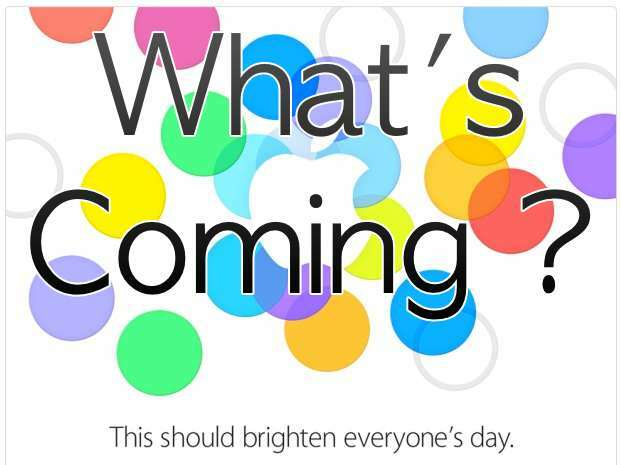 Now EVERYbodys Got One.com: Apple's Sept 10th Event: What's coming ? The rumors have been flying fast and hot for months. Which is, as usual for Apple. No body gets the tech business juices flowing like Apple does. So much so, that competitors, and even not so competitors, have taken to doing their own announcements around Apple events. Trying to ride Apple's coat tails, as it were, to draft off the momentum and buzz that no one but Apple generates. So far it's been Google, Microsoft, Samsung and more. Below I've noted in purple under the guesses, whether the guess was right or not. Sept 10, Tue at 10am PT - Apple's Event. Sept 12 or 13 - iPhones available for pre-order online from Apple & carriers. Yup - iPhone 5c will open for pre-orders on Sept 13, Fri. iPhone 5s will open for pre-orders on Sept 20, Fri at 12:01am PT. Sept 20, Fri - iPhone shipments arrive for online order customers and available for purchase in stores. 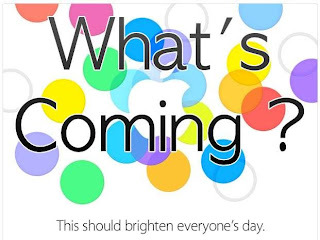 Yup - Both the iPhone 5c and 5s will be available on Sept 20, Fri.
Sept 18, Wed - iOS 7 released to public. Sept 10, Tue - iOS 7 Gold to developers. Storage up to 128GB. Nope - Still tops out at 64GB. Faster A7 processor. Yup - AND it's the first 64-bit processor in mobile devices too. Plus they added the M7 motion coprocessor. New colors, maybe champagne & graphite. Yup - Gold & Silver. MacRumors has a round up of the rumors. MacRumors iPhone 5C round up. The China market in particular will be the world's biggest market for Apple. Not just because there are so many people there. But also because Apple has a prestige there that hasn't fully been tapped until now. The Apple brand represents quality, that other brands do not. Check out All Thing's D article a couple days ago How Big Is Apple’s China Mobile iPhone Opportunity? And Wall Street article today reporting China Mobile is readying to sell the iPhone. They are the largest wireless carrier with 700 million subscribers, which is 7 times the size of Verizon, the largest in the US. So Apple's gonna sell a ship ton load of phones and that could change the market share landscape pretty damn quick. But What Else is Coming ? Based on tons of rumors and reports, these things are less likely or not likely to hit the stage next Tue. But the tech biz has set the bar higher than usual because everybody wants to see major innovation, like an iWatch or an Apple television or an iMagic Wand or something. And the pundits whine that it's over for Apple innovation. I think Phil has something to say about that (in video at 2:23). So I'm hoping Apple will do more next Tue, just to kick things up a notch and shut up some of the whining. But I'm patient and can wait if it doesn't come Tue. Cause I know it will come and building this stuff is hard. It seems clear that Apple's working on something in the wearables area. iWatch maybe. Maybe not... yet. Samsung has unveiled some watches. Not good ones, but they got some press over it. I'm hoping Apple is perfecting something spectacular that will show up next spring. They've got better tech, more talent and more vision than anybody, so if there is a game changer to be had in wearables, they'll find it. Last year NFC on Android devices and NFC retail trials made a lot of noise, but don't seem to have gone very far. Apple a year ago released Passbook in iOS 6. Over the last year Apple execs have talked about NFC and mobile payments - April 2013, Tim Cook on Mobile Payments: 'It's In Its Infancy' and Sept 2012, Phil Schiller 'It’s not clear that NFC is the solution to any current problem'. Steve Cheney in his article On The Future of iOS and Android a month ago made some great points regarding mobile commerce, NFC, Bluetooth and Android fragmentation. Apple's Passbook may evolve with some major leap in functionality. Bluetooth 4.0, which includes Bluetooth Low Energy (BLE), changes everything. And might even lessen or kill the need for NFC. Apple will have to put some mobile payments tech in iPhones. Maybe now's the time. Bluetooth LE, NFC ? There's no one silver bullet tech, that will make mobile commerce and payments go Boom. Whoever integrates the tech the best and fastest, will gain the edge. LTE Advanced or LTE+ network offers data speeds of up to a theoretical maximum of 150 Mbps. Samsung is already planning to put this tech in phones. It's deploying in major markets now, so Apple will need to make a move now or next year. Rumors are that maybe LTE Advanced will show up in the iPhone 5S. New Ultrafast 802.11ac Wi-Fi with speeds up to 1.3 Gbps. This tech was released in refreshed AirPorts and MacBooks about 3 months ago. It might start showing up in mobile devices this year. A7X based iPad and iPad Mini maybe 4Q 2013 and lower cost A6 iPad Mini maybe in 2014. There's lots of iPad rumors and it's soon to be time for a refresh. But Apple will probably focus on iPhone this time around, and iPad later this year or early next. They will certainly be faster, smaller, cooler and maybe cheaper. But there's talk of Retina in Mini, bigger 13" offering and more. So we'll see. This is a big development towards expanding the market for electronic publishing. More platforms for a publishing tech that competes with Amazon's Kindle and Barnes and Noble's Nook. More competition is always good. And the iBook tech, both the reader apps and the authoring app, are technically superior to Kindle. But Kindle has a huge platform reach to iOS, Mac OS X, Android, Windows, Blackberry and web browsers with the Kindle Cloud Reader. So more iBook platforms is good for competition, good for Apple and will make Amazon's tech better. This tech allows web sites to push notifications to website users - even when Safari isn’t running. It's in Mac OS X Mavericks beta right now, but I expect it to come to iOS. And maybe even Safari for Windows too. This is big because no one has done a good job with notifications tech, until now. The tech is either app specific, or device specific. Apple's tech is cross platform, cross devices. Of course they favor their own platforms, iOS and Mac OS X. But it is a compelling advantage. Apple has been beta testing new Apple TV software for months. I find it interesting that it's managed as part of the iOS Developer's Program. Pointing to it's known roots, but perhaps indicating some future unification of sorts or an opening up of the TV platform to developers via a TV App Store. They've been adding apps, content sources and media company deals to the Apple TV more quickly recently. The hardware is due for a refresh, with at least a processor upgrade. Rumors persist of an big push into TV for Apple.